Help students calm their nerves and focus with classroom exercises, for every age, that you can do in 5 minutes or less! August 15 is National Relaxation Day. Introducing stress management, mental health care, and relaxation techniques to K-12 students provides them with powerful mindfulness tools that they can use throughout their life. We’ve put together 11 stress reduction exercises for your classrooms, organized by age range. Each activity takes only one to five minutes! The Benefits: Teaches breath awareness (with lots of movement and fun)! 1. Have students stand in a large circle, facing each other. 2. Ask students to think of their favorite color and then imagine a giant balloon of that color. 3. Have students slowly and deeply inhale through their nose, filling up their bellies (their balloons!) with air. As they fill their bellies up with air, have them extend their arms open and up over their heads as their imaginary balloon fills up. 4. When their balloons are full, students will hold their breath at the top for a moment. 5. You can “pop the balloon” for your students, and students can twist and turn and fall down as they exhale…like a balloon twisting and turning as it deflates. The Benefits: Teaches bodily autonomy and breath awareness. Calms the brain and helps relieve stress. 1. This breathing exercise uses an object so that young students have something tangible to focus their breath on. 2. This exercise is best done with students lying on their backs. If space is accessible for your classroom, have students find a comfortable spot to lie down, legs stretched flat on the ground. 3. Ask students to close their eyes if they feel comfortable having their eyes closed. Tell them that you are going to come around and lay a flower on their bellies. Give students control over their own bodies by letting them know they have a choice of whether or not they want a flower on their belly. If they do not want a flower on their belly and would prefer to just imagine a flower on their belly, ask them to raise one leg in the air. Do not place a flower on those students’ bellies. 4. For the students who want a flower on their bellies, slowly and quietly place a flower on the lower belly of each student. 5. Tell students that they should direct their awareness to their flower (either imaginary or real), right at their belly button. As they bring awareness to the flower, they can also bring their breath to the flower. As they inhale into their belly, the flower rises up. As they exhale out of their belly, the flower goes down. 6. Lead students through five to ten breaths. Each inhale should be the same length as each exhale. If you inhale for three counts, also exhale for three counts. Throughout the entire breathing exercise, students focus on inhaling through their belly and moving the flower upward and downward. 1. If having students lie on their backs is not possible for your classroom, have students sit at their desks. 2. Give each student two stones or beads – one to hold in each hand. 3. Have students sit straight up, with both feet flat on the floor, one bead in each hand, left hand resting on left thigh, right hand resting on right thigh. Students should close their eyes if they are comfortable doing so. 4. Ask students to inhale through the bead in their left hand, up through their left arm, over their left shoulder, across the left side of their neck, through their left nostril, and up to a point on their forehead between both eyes. Have them pause for a moment and then exhale through their right nostril, across the right side of their neck, over their right shoulder, through their right arm, and into the bead in their right hand. 5. When they inhale for the second time, they will inhale through the bead in their right hand and exhale into their left bead. On the third time, they will inhale through their left and exhale through their right. Each cycle is repeated so that the inhale begins through the bead that was just exhaled from. 6. Do this for three, six, or nine cycles, each cycle being an inhale and an exhale through each side. For example, one cycle equals inhale left, exhale right, inhale right, exhale left. The Benefits: Releases excess energy and teaches body awareness of yourself and others. 1. This activity is best with music and requires each student to have their own space. Students can identify their space with a physical object (for example, yoga mats) or they can visualize their space (for example, each student stretches their arms out to see if they can touch their neighbor. Students should not be able to touch, and each student’s arm span is their space). 2. Find a fast, upbeat song to play for this activity. 3. Tell students that when they hear the music, they should shake their bodies as much as possible, their legs, arms, torso, feet, hands, everything! Shake, shake, shake! 4. Tell students that when the music stops, they will clap their hands as loudly as possible, three times. On the third clap, they will leave their hands together and bring them to their heart. They will close their eyes and take three big inhales and exhales. 5. When you start the activity by playing the music and having the students shake, have them shake for at least 30 seconds before clapping and deeply inhaling and exhaling. This allows them to release their excess energy. The clapping and breathing at the end allows them to re-center themselves. If you notice that students still have lots of excess energy after one round of the activity, repeat the exercise a few times! 1. This activity requires music and a visually identified space; for example, a yoga mat or squares on the floor created with blue painter’s tape. The mats or squares should be set up in a circle. 2. This activity is a bit like musical chairs. When the music plays, the students hop from one mat to the next. When the music stops, they freeze on a mat, strike a pose, and take a deep inhale and exhale. 3. There are lots of variations for what students should do when they strike a pose. They could strike the same pose each time; for example, standing up straight, hands together at their heart, eyes closed. They could strike a different pose each time that you cue them. Or you could print a variety of poses on pieces of paper and put the paper visuals at the top of each mat. When the students land on that mat and freeze, they strike the pose that’s shown on the paper. 4. Remember to take a deep inhale and exhale with each freeze/stop of the music. The Benefits: Teaches breath awareness. 1. This breathing exercise asks students to lie on their bellies so that they can feel where the breath is in their body. If students can’t lie on their bellies, have them place their left hand over their belly and their right hand over their chest. 2. If students are lying on the ground, they should be lying flat on their stomach and can use their hands as a pillow. If they are not lying on the ground, have them sit upright, both feet planted firmly on the ground, hands in position (left hand over their belly and their right hand over their chest). 3. Ask students to close their eyes if they are comfortable doing so. 4. Tell students to inhale through their nose in two parts. The first part of their inhale is into their belly. If they are on the ground, they can feel their belly press into the earth. If they are seated upright, they can feel their belly press into their hand. The second part of their inhale is into their chest, so if they are lying on the ground, they feel their chest press into the earth and if seated they press their chest into their hand. 5. Students also exhale through their nose in two parts. First, they exhale from their chest, feeling their chest rise away from the earth or fall away from their hand. Then, the second part of their exhale is from their belly, away from the earth or from their hand. 6. Have students repeat this five to ten times. The Benefits: A quick way to reset and relax. 1. Students can do this exercise seated in a chair. 2. Have students take a deep inhale through their nose. As they inhale, they should tighten the muscles in their body and feel their shoulders rise up to their ears. They can clench their fists, their toes, and their face muscles. 3. Then students exhale through their mouth, releasing all of their muscles, letting their shoulders drop away from their ears, and letting out a big SIGH! WHEW! 4. Repeat this three times as students get the hang of it. The Benefits: Boosts energy, helps with lower back pain, sooths menstrual cramps, and helps to improve focus. Legs-up-the-wall gently boosts blood circulation, which helps to rebalance the body and mind after sitting for long periods. For sixth to eighth grade students, who are growing at a rapid rate, this pose is great to treat fatigue. Students can do this pose when they are studying for long periods and need to refresh and regain focus. 1. Have students find a space along the wall where they can lie down. 2. Have each student begin by sitting upright along their wall space. Their right hip is touching the wall and their legs are extended out in front of them, parallel to the wall. All of the students are looking straight forward, toward their toes. 3. Have students slowly lie back onto the ground as they swing their legs up the wall. Their right hip will rotate along the wall to eventually touch the ground. Their legs will rotate upward along the wall so that they are making an L-shape, with their back on the ground and legs straight up along the wall. 4. Once in position, in an L-shape, have students leave their legs straight up in the air as their feet are pressed flat into the air, as if they were standing on the ground. 5. Ask students to close their eyes if they are comfortable doing so. 6. Let students know that they should breathe naturally and not try to control their breath. 6. Have students stay in that position for five minutes. 7. To exit the posture, have students use their legs to gently push themselves away from the wall about two feet. Have students roll onto their left side so they are in a fetal position. You can let students know that if they try this posture at home, they should roll onto their left side if they plan on returning to activities or studying and should roll onto their right side if they plan to go to sleep afterward. Have students take three deep inhales and exhales in the fetal position and then gently and carefully use their arms to push themselves into a seated position. The Benefits: Gives students a simple, subtle way to draw inward and relieve anxiety…without anyone else noticing! 1. This exercise is a hand position. Students will open their palms up, then place their thumbs inside their palms and wrap their fingers around their thumbs. Their hands will look like clenched fists, as if they were going to throw a punch…except their thumbs are on the inside of their fingers and their awareness is drawn inward instead of outward. 2. Teach your students the hand position and share its benefits. Have students sit with their hands in position, left fist resting on their left thigh and right fist on their right thigh. 3. Have students close their eyes if they are comfortable doing so and take a deep, slow inhale through their nose and a long, slow exhale. Repeat this five times. 4. Let students know that they can do this any time, in any place. They can do this with one fist and with their eyes open. They can do this if they are nervous before a test, if they are feeling anxious about something or someone, or if they want to bring their focus back in to themselves. The Benefits: Balances mind chatter and balances the left and right hemispheres of the brain. Reduces stress and anxiety. Clears toxins. Helps with respiratory allergies. Increases concentration abilities. 1. Have students sit up straight in their chairs, each foot planted into the ground, hands resting on each thigh (palms can face upward toward the sky or downward toward the ground). 2. 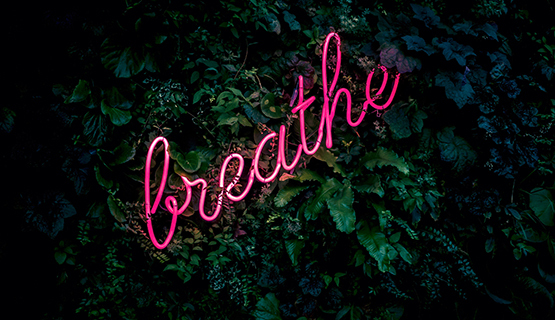 Have students close their eyes if they are comfortable doing so and take three clearing breaths, slowly inhaling and slowly exhaling through their nose. 3. Ask students to gently open their eyes as you show them how they will hold their right hand as they practice this breath. Have students fold the tips of their index and middle fingers inward until they touch their palm, at the base of the right thumb. Align the length of the pinky and ring fingers with the thumb on the right hand. 4. Have students bring their right hand up toward their face. They will place their ring and pinky fingers over their left nostril and their thumb over their right nostril. 5. Have students close their eyes again as they leave their right hand in this position and their left hand on their left thigh. 6. Have students gently close their mouth. Have them close off their right nostril with their thumb. Ask students to inhale for three breaths through their left nostril, then use their ring finger to close their left nostril and exhale for three breaths through their right nostril. Students will repeat this by inhaling through their right nostril for three counts, then closing off the right nostril with their thumb and exhaling through their left nostril. This is one cycle. 7. Have students repeat for three, six, or nine cycles. The Benefits: Teaches emotion regulation and mindfulness. 1. Have students sit up straight, each foot planted into the ground, hands resting on each thigh, palms toward the sky. Then have students gently make a fist with each hand, while still leaving their hands resting on their thighs. Have students close their eyes if they are comfortable doing so. 2. This is a mindfulness meditation, so students do not need to breathe in a controlled way. They should sit still and breathe naturally. 3. As students notice a feeling or a thought float into their awareness, they should squeeze their left fist if they feel negative about that feeling or thought. They should squeeze their right fist if they feel positive about that feeling or thought. Regardless of which fist they squeeze, they should repeat “not mine” in their head and release the thought or feeling. 4. Set a timer and do this meditation for a few minutes. You can start this meditation by doing just one minute and slowly add a minute each time you do this with your students. Meditation takes practice, and the more you do it, the easier it is to sit for longer periods. The Benefits: Reduces anxiety and stress. Is a quick and tangible way to come back into your body when your mind is racing. 1. This activity engages the five senses and asks students to see, hear, smell, taste, and touch. When you first introduce the exercise, bring in something to taste (such as chocolate). You could also get creative and bring in different fabrics to feel. 2. Tell students the benefits of this exercise before you start. When you are in fight-or-flight mode, this is a quick way to ground yourself. 3. To start, ask students to find three things in the room. Notice their color, texture, size, and use. 4. Second, have students sit quietly and listen. What sounds do they hear? Are they loud or soft? Are they high pitched or low pitched? 5. Third, have students inhale through their nose. What do they smell? Have students silently describe the smell. You could also bring in something that has a certain smell, such as lavender, and try this portion of the exercise with that. 6. Fourth, find something to taste. This is where chocolate comes in handy! Have students place a chocolate in their mouth and slowly let it melt instead of quickly chewing it. How does it taste? What is the consistency? How long does it take to melt? 7. Lastly, students will find something to touch. It could be the soft fabric on their shirt, their smooth desk, the way their hands feel when clasped together. Or it could be something you bring in, such as a sheepskin or silk or a stress ball! Notice the texture and qualities of whatever you’re touching. I hope you enjoy these activities and that you and your students find new ways to decompress and refresh!